Just where Is the Space Station, NASA? By Keith Cowing on November 30, 2004 3:21 PM. Editor's note: Why is it that this page, hosted by MSFC, one which shows the current location of the ISS (and the shuttle when it is in orbit), only has an incorrectly identified link (titled simply "spaceflight") to NASA's official Human Spaceflight page buried at the bottom of a separate links page? Again, why is MSFC so reluctant to openly point to clearly relevant websites hosted by other NASA field centers? Why is it that NASA's Human Spaceflight tracking page has no link to MSFC's ISS tracking page - but links to a different page on its own webserver with the same functionality? Given the time and expense that went into developing both trackers, shouldn't people be allowed to see both? But wait, there's more: these two official NASA ISS tracking sites show the ISS at different locations - at the same time! Continue reading Just where Is the Space Station, NASA?. By Keith Cowing on November 30, 2004 1:25 PM. "The committee points out that the total cost of NASA's ill-defined Moon-Mars initiative is unknown as yet, but is likely to be a substantial drain on NASA resources. As currently envisioned, the initiative will rely on human astronauts who will establish a base on the moon and subsequently travel to Mars. The program is in contrast to recent, highly successful NASA missions, including the Hubble Space telescope, the Mars Rover, and Explorer missions, which have revolutionized our understanding of the universe while relying on comparatively cheap, unmanned and robotic instruments. It is likely that such programs will have to be scaled back or eliminated in the wake of much more expensive and dangerous manned space exploration, according to the committee." Apology about law suit. Although your rhetoric was highly inflammatory and misrepresnted the APS POPA report, I should have not have responded in kind. You caught me at a bad moment. I do hope, however,that you will take thetrouble to read the report in its entirety and recognize that it does not criticize the worth of human space flightin general, as you allege. I also hope that by now you are aware that some of the NASA plus up in the Omnibus bill came at the expense of the National Science Foundation, consistent with the APS POPA report forecast. Continue reading Here come the naysayers. By Keith Cowing on November 29, 2004 8:10 PM. Editor's note: less than 24 hours after NASA Watch made note of this omission on the part of MSFC, a link to NASA's VSE suddenly appeared on this MSFC web page. However, they did not bother to add the link to this website's companion, ciencia@nasa.gov. Editor's note: Why is it that the Science@nasa.gov website at MSFC still has no linkage whatsoever to NASA's Vision For Space Exploration (VSE)? This is especially odd given that this MSFC-hosted site claims that it's mission is "to help the public understand how exciting NASA research is and to help NASA scientists fulfill their outreach responsibilities." It is almost as of there are two public affairs organizations at MSFC. Continue reading Website Folks at MSFC Still Ignore VSE - and the Rest of NASA. By Keith Cowing on November 29, 2004 4:25 PM. "In a splendid portrait created by light and gravity, Saturn's lonely moon Mimas is seen against the cool, blue-streaked backdrop of Saturn's northern hemisphere. Delicate shadows cast by the rings arc gracefully across the planet, fading into darkness on Saturn's night side." Editor's note: You simply must look at this image full-sized. What you see here is just a small piece. By Keith Cowing on November 29, 2004 8:44 AM. "Our feeling is that NASA should look very hard at terminating its two costliest programs, the International Space Station, now orbiting in a partially built state overhead, and the shuttle fleet that is being resuscitated to carry parts and astronauts up to the station. Those two programs eat up much of the NASA budget for little real gain." By Keith Cowing on November 29, 2004 8:39 AM. "The Expedition 10 crewmembers successfully relocated a Soyuz spacecraft at the International Space Station this morning, setting the stage for their upcoming spacewalks. The relocation of the Soyuz allows Chiao and Sharipov to use Pirs as the airlock for their two spacewalks." By Keith Cowing on November 28, 2004 2:28 PM. "NASA's plan to launch a remote-controlled, two-armed android to repair the Hubble Space Telescope may cost almost as much as taxpayers paid to build the vaunted observatory in the first place. The estimated price tag of a robotic rescue mission -- between $1 billion and $2 billion -- is raising eyebrows and questions about whether Hubble is worth the investment amid tight budgets and periodic reports of technical woes that could cripple the spacecraft before the robot gets there." By Keith Cowing on November 27, 2004 11:25 PM. Lori Garver: "The approval of the budget was aided by strong support from The White House, which requested full funding for the new human spaceflight exploration policy." Lori Garver: "You say you haven't heard anything from the Kerry-Edwards folks during the campaign - I haven't heard word one from the Bush-Cheny folks about the space program during the campaign either. Its not clear to me that they believe they are on the right side of this issue with the public." Lori Garver: "The Bush initiative is simply hot-air and has made it impossible in an election year for Kerry to say much on space." By Keith Cowing on November 27, 2004 1:34 PM. By Keith Cowing on November 27, 2004 11:11 AM. "If the next step is to send humans to Mars, then we must reexamine our culture of averting risk and assigning blame. We don't need any miracle breakthroughs in technology. The techniques are well understood. Sure, it takes money, but distributed over time it doesn't require any more than we're spending now. What is lacking is the will, the mandate, and the sense of purpose." "So my message is in whichever realm, be it going into space or going into the deep sea, you have to balance the yin and yang of caution and boldness, risk aversion and risk taking, fear and fearlessness. No great accomplishment takes place, whether it be a movie or a deep ocean expedition, or a space mission, without a kind of dynamic equipoise between the two. Luck is not a factor. Hope is not a strategy. Fear is not an option." By Keith Cowing on November 24, 2004 3:30 PM. "Northern Territory scientists were last night studying what could be the first photograph of a meteorite hitting Earth. The chances of an impact being captured on film are millions to one." By Keith Cowing on November 24, 2004 2:54 PM. "Donald R. Puddy, 67, whose 31-year career with NASA spanned the Apollo, Skylab and Space Shuttle programs, died Nov. 22 in Houston following a lengthy illness. Puddy joined NASA's Johnson Space Center in 1964 and spent 22 years as a key leader of human space flights in the Mission Control Center." By Keith Cowing on November 24, 2004 12:38 PM. "Proposed Rule: Anytime that a GSFC scientist/manager meets with the media, a PAO representative must be present and the meeting must be sound-recorded. This includes phone conversations. There is a question as to what constitutes an interview." By Keith Cowing on November 24, 2004 12:05 AM. "A mosaic of nine processed images recently acquired during Cassini's first very close flyby of Saturn's moon Titan on Oct. 26, 2004, constitutes the most detailed full-disc view of the mysterious moon. The view is centered on 15 degrees south latitude, and 156 degrees west longitude. Brightness variations across the surface and bright clouds near the south pole are easily seen." By Keith Cowing on November 23, 2004 4:25 PM. "NASA is funded at $16.2 billion, $822 million above last year and $44 million below the request.The agreement give NASA almost total funding flexibility, but requires NASA to report to the Congress within 60 days on how they will adjust program values to cover increased costs associated with the Hubble servicing/repair mission and shuttle return-to-flight activities. This flexibility is unprecedented and gives the Administrator broad latitude to implement the Presidents vision for Space within the funds provided in the bill." By Keith Cowing on November 23, 2004 9:14 AM. "The official denials are literally accurate, despite repeated references in NASA's own internal documents to "layoffs." Most of the job cuts will be accomplished through attrition, retirement and leaving slots vacant -- not handing workers pink slips. The bottom line, however, is that fewer people will be preparing the shuttle fleet for its return to flight. Those remaining may work longer hours at a critical time." "Through a hectic weekend of politicking, all NASA learned was its friends in Congress somehow convinced colleagues to support the agency's full request for $16.2 billion -- with threats of a presidential veto hanging over their heads if Bush's moon-Mars plan did not get full funding." "In fact, NASA was such a priority that the increase of $822 million to its budget prompted deeper cuts in other agencies. Before the NASA increase, the spending bill already provided for an across-the-board cut, for each domestic agency, of 0.75 percent from what Congress had planned to spend in the new fiscal year, budget aides said. Once the NASA money was added, the across-the-board cuts were raised to 0.8 percent." By Keith Cowing on November 22, 2004 9:36 PM. Editor's note: NASA won an impressive legislative victory this past weekend when Congress voted to give the agency virtually everything the President asked for so as to begin the implementation of the space policy he announced earlier this year. Curiously, the response from those who were pushing for such action has been rather tepid. In some cases there has been no reaction at all. Continue reading NASA Wins Big - Yet Supporters Hardly Take Notice. By Keith Cowing on November 22, 2004 1:00 PM. "Update on reboost underperformance: The Russian Commission looking into the 11/17 reboost underburn has unanimously determined that both onboard hardware and software involved in the maneuver were not at fault, and that the underperformance was caused by human error. Whether an additional reboost is needed to make up for the delta-V deficit, with a commensurate slip in Progress 16P launch, still needs to be determined by a joint ballistics team. [It appears that a new onboard computer setting controlling fuel flow, installed about a month ago, should have been inhibited for the reboost maneuver, but the single command to do so was left out of the uplinked command sequence.]" Continue reading Progress Fails to Raise ISS Orbit According to Plan. By Keith Cowing on November 22, 2004 11:19 AM. "Congressman Tom DeLay (R-Texas), joined by local Houston community leaders, will discuss NASA's budget with media at 2 p.m. CST today, Monday, Nov. 22, at NASA's Johnson Space Center in Houston." By Keith Cowing on November 22, 2004 1:43 AM. "There are dozens of unofficial web sites spawned each season by Antarctic program participants. These sites typically include journals with daily entries and photo galleries. Some feature poetry and music inspired by experiences on the Ice." Editor's note: The websites and weblogs ("Blogs") linked to by this article should serve as a preview of what people are going to do on missions to the Moon, Mars, and elsewhere. The journals I wrote during my two, one-month stays at the NASA Haughton Mars Project on Devon Island  are similarly inspired - as are Ed Lu's Expedition 7 Journal entries and Peggy Whitson's Expedition 5 Letters Home written during during their time aboard the ISS. By Keith Cowing on November 21, 2004 4:44 PM. SEN. JOHN McCAIN, (R-AZ) "... We've got to have some kind of way of challenging these earmarks. We've got to have the president perhaps have the line-item veto. We've got to exercise not only overall budgetary control, but stop these earmarks. We're harming agencies like NASA and their ability to carry out their mission because we're diverting so much of the funds to other projects that are unnecessary and wasteful." By Keith Cowing on November 21, 2004 9:16 AM. "Lawmakers approved a massive budget package Saturday that includes $16.2 billion for NASA and gives the agency an unusual amount of flexibility in deciding how to spend the money. Backers of the space program, including House Majority Leader Tom DeLay and the White House, fought until the end of negotiations to secure more money for the National Aeronautics and Space Administration." By Keith Cowing on November 21, 2004 8:05 AM. 21 November 2004: Editor's note: The Senate did not take up H.R. 5382 before adjourning. There is one last chance for them to do so in December when they recovene. If this bill is not voted on during that session it will be dead and will need to be reintroduced in the next Congress. The reasons why H.R. 5382 did not go further in the Senate are unclear. While supporters sought to fast track the bill through the Senate others sought to stall it. It is not certain whether efforts to delay consideration of this bill this had to do with the content of the bill or if it was simply partisan politics. Continue reading H.R. 5382: House Passes, Senate Delays. By Keith Cowing on November 20, 2004 12:57 PM. "In the pre-dawn hours Saturday morning, a House-Senate conference committee reversed itself and agreed to fully fund $16.2 billion for NASA's FY05 budget. The conferees had been moving towards a $15.9 billion appropriations for the space agency. The final amount is exactly what President Bush had requested for NASA, and fully funds the space shuttle, space station resupply, and initial spending for the president's space exploration vision. Continue reading Comments from Frank Sietzen on NASA Budget. By Keith Cowing on November 20, 2004 12:38 PM. "NASA's Swift satellite successfully launched today aboard a Boeing Delta 2 rocket at 12:16 p.m. EST from Launch Complex 17A at the Cape Canaveral Air Force Station, Fla. The satellite will pinpoint the location of distant yet fleeting explosions that appear to signal the births of black holes." By Keith Cowing on November 19, 2004 5:29 PM. "Dear Space Advocates & Correspondents: This afternoon the House of Representatives had a 40 minute debate on legislation designed to advance the U.S. commercial human spaceflight industry. It was a good and spirited debate, with bipartisan supporters speaking in favor, and two partisan Democrats speaking against HR5382. Unfortunately, the opponents' arguments reflected the same misunderstanding of this issue that so many people have. Their presumption is that the federal government needs to set standards to protect the safety of the early adventurers who wish to buy a risky ride into space. Continue reading Jim Muncy's Thoughts on HR 5382. By Keith Cowing on November 19, 2004 1:33 PM. 18 November 2004: S. RES. 470: Honoring the life of astronaut Leroy Gordon Cooper, Jr.
"Whereas Gordon Cooper was the first man to go into space for a second time;"
Editor's note: A NASA Watch reader just reminded me "I thought Gus Grissom was the first man to go into space twice: Liberty Bell 7 and Gemini 3." Perhaps the resolution should have said "Whereas Gordon Cooper was the first man to go into orbit for a second time." "The closing narration states Gordon Cooper was "the last American ever to go into space alone''. While true when the film was made, Mike Melvill in June and September 2004 and Brian Bimmie in October 2004 went into space alone in Scaled Composites' SpaceShipOne. Bimmie's flight coincidentally was the day Gordon Cooper died." NASA Advisory Council Changes Ahead? By Keith Cowing on November 19, 2004 9:40 AM. "The meeting will be open to the public up to the seating capacity of the room. The agenda for the meeting is as follows: Transforming the NASA Advisory Council Structure." Editor's note: at the last NAC meeting in September (which was closed to the public) the topic of revising the format of the NAC was discussed. Among the ideas presented by NASA was reformatting the NAC along the lines of a suggestion made by the Aldridge Commission that NASA look to the Defense Science Board and the role it serves in focusing advice for the DoD. By Keith Cowing on November 19, 2004 1:06 AM. "NASA held a three-day meeting in Washington, DC this week where representatives from space agencies around the world exchanged ideas regarding future exploration - and looked for possible modes of cooperation." By Keith Cowing on November 19, 2004 12:15 AM. "Citing unreleased documents, Lockheed Martin Corp. alleged in a court filing that former Air Force official Darleen A. Druyun shared with senior Boeing Co. officials proprietary Lockheed information during a 1990s rocket launch competition." Continue reading Boeing's Headaches Continue. By Keith Cowing on November 18, 2004 12:31 PM. "This special issue of Wired is about honest-to-God, two-fisted,hairy-knuckled exploration. The kind where you go places no one'sgone before, then brag about it later... if you live... We stand onthe edge of a glorious new age of exploration. The future is readyand willing - if we are.'" By Keith Cowing on November 18, 2004 12:13 PM. "The Committee will advise NASA Administrator on Mars exploration, including robotic exploration of Mars to search for evidence of life, to understand the history of the solar system, and to prepare for future human exploration." Is the National Space Society Fading Away - or Bouncing Back? By Keith Cowing on November 17, 2004 7:29 PM. Editor's note: Reliable sources reveal that the National Space Society (NSS) has worked out an arrangement where the publishing of its magazine "Ad Astra" will now be handled by space.com. That transition will happen over the next month or two. Discussions have also been held with various parties with regard to the possible merger of NSS and The Space Foundation. Continue reading Is the National Space Society Fading Away - or Bouncing Back?. By Keith Cowing on November 17, 2004 5:09 PM. Editor's note: NASA KSC PAO has received word that Reuters space reporter Brad Liston died early Tuesday morning. Frances Kerry, Reuters Bureau Chief, Miami: "I am extremely sad to say that Broward "Brad" Liston, a talented and much-admired central Florida and Cape Canaveral freelance reporter for Reuters for nearly a decade, died suddenly on Tuesday after being taken ill with pneumonia. He was 47." Continue reading Brad Liston Has Died. By Keith Cowing on November 16, 2004 9:36 PM. "NASA's Exploration Systems Mission Directorate (ESMD) selected 70 proposals to support the research and technology goals and objectives of the Vision for Space Exploration. The total value of the work is more than $1 billion through fiscal year 2009. More than 3700 Notices of Intent were submitted to NASA, evaluated, and subjected to an integrated review across project areas." By Keith Cowing on November 16, 2004 7:40 PM. "NASA's X-43A research vehicle screamed into the record books today, demonstrating an air-breathing engine can fly at nearly 10 times the speed of sound." "Future applications for hypersonic flight include precision time-critical strike weapons with significant stand off capability..."
Continue reading Mach 10 Attempt a Success. By Keith Cowing on November 16, 2004 12:49 PM. "NASA is lobbying Congress for the authority to award prizes of more than $250,000 in its Centennial Challenges program, and hopes to get a green light during the current lame-duck session of Congress or early next year. NASA needs authorization from Congress to award prizes of more than $250,000. Centennial Challenges Program Manager Brant Sponberg met with authorizers on Capitol Hill to discuss the issue Nov. 15." By Keith Cowing on November 15, 2004 11:04 AM. "NASA will participate in the National Society of Black Engineer's (NSBE) Region V Fall Regional Conference Nov. 19-21 at the Hilton Americas Hotel, Houston, to showcase the engineering contributions that make space exploration a reality." By Keith Cowing on November 15, 2004 8:49 AM. Editor's note: Gee, Lori. Talk about being naive. When you and/or your candidate say something in public - people remember. By Keith Cowing on November 14, 2004 1:10 PM. "Nearly two years after the Columbia disaster, some NASA managers fear that cost-cutting measures and pressure to resume shuttle launches are jeopardizing critical safety reforms. Confidential interviews with shuttle officials, as well as internal NASA documents and e-mails obtained by the Orlando Sentinel, portray a program rushing to fly again despite serious money problems and growing concerns about meeting an ambitious schedule." "When this proposed schedule was presentedto theSFLC in September 2004 they replied that they wanted to have the Shuttle/Space Station community assess the schedule - and then come back to theSFLC on29 October 2004. the SFLC wants to know if this new schedule is actually capable of working - and what the associated risks are in implementing it." By Keith Cowing on November 13, 2004 12:13 PM. "The charges against Gregory L. Hansen and Kenneth E. McDonald stemmed from a case in which they allegedly created a fake company and submitted phony purchase orders on construction work at KSC through their employer, Olson Electric Co. of Daytona Beach. U.S. Department of Justice anti-trust attorney Richard Reed has told a judge in Atlanta that the men are providing "substantial assistance" that should lead to the prosecution of others involved in construction contract fraud at the center." Editor's note: 12 November 2004: Channel 6 WKMG will be airing a story tonight at 11:00 pm EST regarding "bid-rigging" at KSC. According to WKMG "A major scheme at the Kennedy Space Center is uncovered. The Problem Solvers learn indictments are on the way from a federal investigation into a bid-rigging plan." By Keith Cowing on November 12, 2004 6:19 PM. "Managers from NASA JPL, who directed operations of the Mars rovers, will lend their experience to a practice session by Space Shuttle mission managers next week at NASA JSC in Houston. The session is part of a continuing exchange of best practices that began with multiple visits by Deputy Space Shuttle Program Manager Wayne Hale to JPL to observe critical periods of the Mars Exploration Rover Mission." By Keith Cowing on November 12, 2004 4:12 PM. "NASA Administrator Sean O'Keefe today appointed astronaut C. Michael Foale as Deputy Associate Administrator for Exploration Operations reporting to both NASA's Associate Administrators for Exploration Systems and Space Operations." By Keith Cowing on November 12, 2004 12:12 AM. "Orbital Recovery Ltd. has completed its second round financing for the ConeXpress Orbital Life Extension Vehicle (CX OLEV), marking a major program milestone that allows production of the first "space tug" to begin in early 2005, followed by the initial operational mission approximately 36 months later." "The Hubble Robotic Vehicle will be built from scratch, giving the United States a robotic rendezvous and docking capability for the first time in the history of space travel." By Keith Cowing on November 11, 2004 11:11 PM. 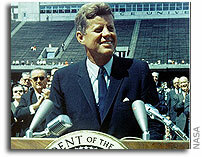 "Endorsement of the space program in general is very strong, with 69% of Americans voicing their support. Interest and excitement about the Vision for Space Exploration is strong for near-term aspects of the plan (65% of Americans responded positively) and for returning to the Moon. This is not true for plans to send humans to Mars, which is seen as involving much more risk (only 18% of Americans responded positively)." By Keith Cowing on November 11, 2004 9:27 PM. "Anatoly Perminov, the head of the Russian Space Agency (RSA), will go this mid-December to the United States to make a statement in the US Congress, reports his assistant Vyacheslav Davidenko. "Perminov plans to go in the middle of December on an official visit to the United States at NASA invitation. The RSA head is expected to make a report in the US Congress on progress in the construction and further exploitation of the International Space Station as well as to discuss the sale of Russia's cargo Progress rockets and Soyuz spaceships for carrying new crews to the International Space Station," said Davidenko." By Keith Cowing on November 11, 2004 11:33 AM. "However, just after the integration, we faced a series of malfunctions and troubles including the failure of H-IIA launch vehicle No.6, for which I felt personal responsibility. I have, therefore, been working with the executives and employees as a team for the purpose of resuming launches and restoring public trust." By Keith Cowing on November 11, 2004 11:31 AM. SUMMARY: This notice announces the release of the Appendix 3 to the Draft Strategic Plan for the U.S. Integrated Earth Observation System and extension of the public comment period by the National Science and Technology Council's (NSTC) Committee on Environment and Natural Resources (CENR) Interagency Working Group on Earth Observations (IWGEO). This draft plan was prepared to address the effective use of Earth observation systems to benefit humankind, and Appendix 3 provides a summary of the state of the current observation systems addressed in the plan. By Keith Cowing on November 11, 2004 9:38 AM. "The prize will be awarded to a craft that can take a crew of at least five people to an altitude of 400 kilometres, and complete two orbits of Earth. This feat will have to be repeated within 60 days. The craft must be able to dock with Bigelow's space hotel (which he hopes to launch in 2008), and be capable of staying docked in orbit for six months." "The XCOR Steam Engine Prize is being offered to anyone who delivers a "steam engine" that meets the requirements of the rules. Third place is USD $2,500.00 to the first person or organization that meets all the requirements listed in the rules." By Keith Cowing on November 11, 2004 12:33 AM. Editor's note: No mention is made in this press release of who actually sponsored this study (Lockheed Martin). "Atlas V ranked highest overall, ranking first place in three out of the four factors." 1 The research underlying this report was sponsored by Lockheed Martin; however, the analysis and conclusions were developed by Futron. By Keith Cowing on November 10, 2004 11:30 AM. 10 November 2004: Update: NASA Watch and SpaceRef have come to an amicable resolution to this issue with Orbital - one wherein the threat of legal action has been avoided to the satisfaction of both parties. Continue reading Orbital Demands Story Retraction. By Keith Cowing on November 10, 2004 9:09 AM. "MR. McCLELLAN: It's reflected in our budget and I think it will be reflected in our upcoming budget, as well. Remember, this is a long-term vision that the President outlined for NASA, that made sure that they were focused on a very clearly-defined mission that is based on 10, 20, 30, 40 years down the road. So he remains committed to it." By Keith Cowing on November 10, 2004 9:00 AM. "The FY 2005 VA, HUD, and Independent Agencies bill is very problematic. In order to get the Senate bill out of committee, appropriators designated $2 billion as "emergency" spending for VA health care and NASA, money that did not count against the spending cap." By Keith Cowing on November 9, 2004 5:31 PM. "The launch of NASA's DART spacecraft aboard an Orbital Sciences Pegasus XL scheduled for Tuesday is postponed. A review of projected loads data, or the G-forces the payload experiences upon ignition of the Pegasus second stage, is being re-evaluated to ensure mission success." Editor's note: I had to read this more than once to make sure I got it right. Isn't this the sort of analysis that should have been done months - perhaps years ago - not days before a launch - one that has already been delayed? Someone sure dropped the ball on this one. Its nice to see that a potential issue was caught in time - but I have to wonder what would have happened if the launch had gone ahead in October. Was this information available at that time? Continue reading NASA Gets Last Minute Jitters about DART. By Keith Cowing on November 9, 2004 10:00 AM. Editor's note: Tomorrow morning (9 November) Northrop Grumman and Boeing will announce that they have entered into a teaming arrangement with regard to building hardware for NASA's new exploration programs - the most notable being the Crew Exploration Vehicle (CEV). With regard to CEV work under the teaming agreement, Boeing will become a principal subcontractor to Northrop Grumman. As work progresses toward Spiral 2, Boeing will become the prime contractor. These two companies will be holding a telecon for reporters on 9 Nov at 1:00 pm EST. By Keith Cowing on November 8, 2004 6:40 PM. "Spacehab today announced that it has filed a formal claim against NASA under the Federal Tort Claims Act seeking restitution of its losses totaling in excess of $79.7 million resulting from the tragic destruction of the Space Shuttle Columbia on February 1, 2003." Continue reading Spacehab Takes NASA to Court. By Keith Cowing on November 8, 2004 9:55 AM. "The space policy was introduced not even a year ago and support was lagging from the start. Nobody (in Congress) really embraced it at first," [NASA Watch editor Keith] Cowing said. Now dates will be put with goals, he added. U.S. Rep. Bud Cramer, D-Huntsville, predicted it still will not be an easy ride for Bush's plan because members of both parties question giving a priority to space exploration in times of war and social needs. "There's not been a lot of support for it" on Capitol Hill. "There are members who support part of the plan but not all of it," Cramer said during a meeting at The Times in late October. "Where it will go after the election" depends on budget priorities and the war." By Keith Cowing on November 8, 2004 7:05 AM. "The tests take one of the cells from the egg. If instead using the cell for genetic tests, the cell could be used to start a new line of stem cells. The procedure would be no more destructive than existing testing. A case can be made that it is the moral equivalent of a bone marrow transplant or a kidney transplant." Editor's note: As a biologist I just shuddder when I see people mangle basic concepts in biology. In this case, Sam Dinkin tries to explain stem cell biology and makes one error per sentence in so doing. He then tries to link his error-prone primer on stem cell research to legislation to promote launch research. Next time do a little research before you write, Sam. By Keith Cowing on November 7, 2004 10:13 PM. "There is also a more tangible piece of New York on Mars. On each rover, a curved piece of metal the size of a credit card and adorned with the American flag was cut out of debris from the World Trade Center....Until now, that knowledge has remained within the mission team. "It was intended to be a quiet tribute," Mr. Gorevan said. "Enough time has passed. We want the families to know." By Keith Cowing on November 7, 2004 6:41 PM. "Rutan also won bragging rights over the space establishment, which he frequently criticizes for being inefficient and bureaucratic. "You know, I was wondering what they are feeling, 'they' being that other space agency," Rutan laughs. "And, uh... you know, quite frankly, I think the big guys, the Boeings, the Lockheeds, the nay-say people at Houston, I think they're looking at each other now, and saying, 'We're screwed!' Because, I'll tell you something, I have of a hell a lot bigger goal than they do!" He's already at work, designing the details." "On Saturday, engineers were treated like rock stars. St. Louisans connected their past glory to a future legacy. And the winners in this generation's latest space race accepted a $10 million prize while promising a ticket to the heavens." By Keith Cowing on November 5, 2004 11:26 PM. "President Bush will not ask his appointees for the mass resignation letters that sometimes have been requested with a change of term but instead wants the aides to keep doing their jobs unless they are told otherwise, White House officials said yesterday." "Fulfilling President George W. Bush's ambitious plan to return humans to the Moon will create down-to-earth benefits, rocketing advances in computer science and other technologies, the chief of NASA said." "A leading contender for the Pentagon chief's job would be National Security Adviser Condoleezza Rice ... Other candidates include Sean O'Keefe, head of the National Aeronautics & Space Administration, and Navy Secretary Gordon England." By Keith Cowing on November 5, 2004 10:53 PM. "Owing to the proximity of the Moon to Earth, there are important technological and scientific concepts that could be developed on the Moon that will provide valuable insights into both the origin and evolution of the terrestrial planets and be feed-forward to the scientific exploration of Mars. This document identifies important lunar scientific and technology goals and evaluates them with regard to how they could provide valuable insights for Mars." By Keith Cowing on November 5, 2004 4:57 PM. "To cast a wide net for supporting future prize competitions, NASA's Centennial Challenges program today issued two Requests for Information (RFI) and one Announcement of Partnership Opportunity (APO)." Did Something (Someone) Dent ISS? By Keith Cowing on November 5, 2004 12:58 PM. "Next week the SSRMS (Space Station Remote Manipulator System) will be used for an outside inspection of what appears to be a "dent" in the Lab module's exterior surface, specifically in the MM/OD (micrometeoroid/orbital debris) shielding surrounding the pressure shell." Am I Just Seeing Things That Aren't There? By Keith Cowing on November 5, 2004 2:06 AM. Editor's note: Opportunity is curently moving over to the other side of Endurance crater toward a series of slopping rock formations. Browsing though the latest images I found this one here. Some things immediately caught my eye. Continue reading Am I Just Seeing Things That Aren't There?. By Keith Cowing on November 4, 2004 4:07 PM. "President Bush's re-election will jump-start his plan to send astronauts back to the moon, transforming a new vision for space exploration into serious marching orders, analysts said Wednesday. What's more, NASA will have until 2008 to get the new presidential initiative entrenched enough to make it difficult to undo." By Keith Cowing on November 4, 2004 11:35 AM. Editor's note: Ironically, the back side of the quarter honoring Ohio, the state upon which the outcome of this election rested, features both the Wright Flyer and an astronaut on the lunar surface (Neil Armstrong). So far the space landscape in Congress has only changed a little. Of all the key players, only Rep. Nick Lampson (D-TX) has lost a reelection bid. One change in the House Science Committee should be expected: chairmanship of the Space and Aeronautics Subcommittee. Rep. Dana Rohrabacher (R-CA) got the nod to continue as chair in the current Congress even though term limits would have otherwise moved him out. Rep Ken Calvert (R-CA) has expressed interest in the position. "Tuesday's elections will usher in a change in aviation leadership across the board in both the House and Senate, throwing the future of pending legislation into uncertainty." By Keith Cowing on November 4, 2004 2:20 AM. "Five spots - one colored white, one blue, and three black - are scattered across the upper half of the planet. Closer inspection by NASA's Hubble Space Telescope reveals that these spots are actually a rare alignment of three of Jupiter's largest moons - Io, Ganymede, and Callisto - across the planet's face. In this image, the telltale signatures of this alignment are the shadows [the three black circles] cast by the moons." By Keith Cowing on November 3, 2004 12:34 PM. On 30 October 2004 President Bush signed into law H.J.RES.57 "Expressing the sense of the Congress in recognition of the contributions of the seven Columbia astronauts by supporting establishment of a Columbia Memorial Space Science Learning Center"
By Keith Cowing on November 3, 2004 10:34 AM. "NASA is currently preparing a set of high-level national roadmaps that will form the foundation of the Agency's strategic plan. "Strategic Roadmaps" will explore options and establish pathways for achievement of NASA's strategic objectives. "Capability Roadmaps" will recommend approaches for providing certain technical capabilities judged to be critical to NASA's future programs." By Keith Cowing on November 3, 2004 10:17 AM. "Purpose and Objective: The Committee will advise NASA Administrator on matters related to Exploration Systems. The Committee will draw on the expertise of its members and other sources to provide its advice and recommendations to the Agency. Balanced Membership Plans: The Committee will consist of non-NASA employees. In addition, there may be associated members selected for Committee, Subcommittees or Panels." By Keith Cowing on November 2, 2004 1:56 PM. Letter from Wayne Hale - Why does Rice play Texas? "When the historians replay the tape of JFK's speech, they generally clip out the phrase 'WHY DOES RICE PLAY TEXAS?' because the reference may be obscure to some or perhaps because it seems less important than climbing Mount Everest or Lindbergh flying solo across the Atlantic. But you miss an important point if there is gap in the recording." By Keith Cowing on November 2, 2004 1:37 PM. Editor's note: This internal NASA planning document shows tentative dates for Soyuz, Progress, Shuttle, and Ariane V/ATV launches. It also shows payloads to be launched and handover dates for upcoming expeditions. By Keith Cowing on November 2, 2004 10:53 AM. "NASA has been named the 2004 Agency of the Year by a federal organization honoring excellence in financial management. NASA was honored for its implementation of the Web Time and Attendance Distribution System (WebTADS), a Web- based system that collects employee time and attendance information." "Purpose and Objective: The Committee will advise NASA Administrator on matters related to Agency financial management. The Committee will draw on the expertise of its members and other sources to provide its advice and recommendations to the Agency." "While the current Administrator was touted as a "bean counter" who would restore fiscal responsibility to the space agency, he has in fact presided over an agency who has now failed to achieve a passing grade on independent audits of its books for two of the last three years. More troubling, NASA's own inspector general has concluded that NASA is not likely to receive a clean audit for the next five years, and both the IG and the GAO have identified a series of problems with NASA's implementation of its financial management system." "During the audit, we identified management control weaknesses for ensuring that designated Contracting Officer Technical Representatives (COTRs) received the required training. We found that, in some cases, COTRs lacked the required training necessary to carry out their delegated duties and responsibilities." By Keith Cowing on November 1, 2004 8:37 PM. "When the rovers landed last January, they had a minimum design specification for 90 sols (Martian days) of life. But Spirit this week is closing in on 300 sols as Opportunity presses toward 275. Some engineers believe the rovers could now survive 600 or more sols, well into 2005." "A report into the loss of British Mars probe Beagle 2 says a failure by the UK government to commit funds early enough undermined the project's credibility." By Keith Cowing on November 1, 2004 6:41 PM. "China's second manned space flight will be conducted by two astronauts over five days in 2005. Unlike Shenzhou-V, which flew with a single astronaut for 21 and half hours a little more than a year ago, the next flight will see two astronauts fly in space for five days. Their capsule is designed to be capable of orbiting for a whole week, the spokesperson said. "For the first time, astronauts will enter and live in the orbital module of the spacecraft to do scientific experiments," said a statement from CAST, the major manufacturer of the manned spacecraft and its launch vehicle." Small Moon (Prometheus?) Caught in the Act of Disturbing Saturn's F Ring? By Keith Cowing on November 1, 2004 4:25 PM. Editor's note: I was wandering through Cassini's raw image collection last night and came across this peculiar image. According to the official description this image was "taken on October 29, 2004. The camera was pointing toward Saturn's rings at approximately 790,933 kilometers away." Just inside the ring there appears to be a small moon passing by. If you look at the enlarged version of this image you can see what appears to be disturbances in the ring which seem to be a direct result of the moon (Prometheus?) passing nearby. I have sent a request. Perhaps someone at JPL will tell us what we are looking at. By Keith Cowing on November 1, 2004 4:10 PM. "The U.S. Air Force quietly has put into service a new weapon designed to jam enemy satellite communications, a significant step toward U.S. control of space. The so-called Counter Communications System was declared operational late last month at Peterson Air Force Base in Colorado Springs, Colorado, the Air Force Space Command said Friday in e-mailed replies to questions from Reuters." By Keith Cowing on November 1, 2004 4:08 PM. Editor's note: There are several somewhat odd articles on The Space Review run by Jeff Foust at Futron. One article "Both ends of the spectrum" by Sam Dinkin concludes with the author stating that he does not plan to vote (and thus becoming part of the problem). The other article "November's moral dilemma" by Greg Zsidisin mentions George Bush and Adolph Hitler in the same sentence (it goes downhill from there). On the other hand, Rand Simberg has an article "A Space Program vs. the Moral Equivalent of a Space Program" online at Tech Central Station which takes a much more reasoned (and responsible) look at space policy and the election. By Keith Cowing on November 1, 2004 3:17 PM. Editor's note: This week's issue of Space News (as well as last week's) has a lot of good material relevant to space policy and the election. One item of interest is a letter titled "Partisanship Dangerous for the Space Program" written by Planetary Society Executive Director Louis Friedman. The letter ends with one of the silliest leaps of logic I have seen in years: "But if Internet bloggers persist in polarizing the shuttle issue, and in using that issue for personal attacks on the Kerry campaign, then we can look forward to two possibilities: If Kerry wins it will most likely result in a reaction against anything Bush has proposed. If Bush wins it will destroy the chances to build widespread congressional and public support for human space exploration. Either way the space program loses." Aw c'mon Lou. I assume NASA Watch is among the offending websites you are referring to. Suggesting that what is on NASA Watch or any other website is going to affect how either Kerry or Bush are going to frame and then pursue their space policy is just plain silly and suggests a certain ignorance on your part as to how the world works. On the same page Kerry space advisor Lori Garver whines about the way Space News handled statements by her and Frank Sietzen. She closes with the following hollow plea: "We in the space community require bipartisan support for our initiatives and programs to be successful. We ask Democrats and Republicans alike to support our issues. We cannot expect continued bi-partisan support unless the aerospace community treats each political party equally." All I can suggest for Lori (who is as partisan as they come): if you really wanted to see space issues treated on a bi-partisan (preferably non-partisan) basis, then why on Earth did you openly align yourself with a specific candidate - and party? You helped make this partisan, Lori ! By Keith Cowing on November 1, 2004 9:12 AM. (16) Terminate the National Aerospace Plane Program. (1) Terminate NASA's support for producers of commercial airlines. (4) Terminate the International Space Station Program. Continue reading The Day John Kerry Tried to Gut NASA - All By Himself.